Everyone loves beaches - those long and often beautiful stretches of minute particles of sand which form such a delicate and narrow a barrier separating the great continents from the great oceans of the world. Even in the cooler and more temperate regions, this beigy yellow band can create a marked and very attractive contrast between the two realms of land and water. In warmer climes, the sandy beach conjures up a truly evocative, romantic image. Blue seas lapping on the shore, the green fronds of palm trees gently swaying in the breeze, a clear blue sky and a golden sun blazing down on a golden yellow beach. What all such mental images have in common is the colour. Beige, yellow, gold. Precise shades and tones may vary but as soon as someone talks about a beach, we immediately think of yellow or yellowish sand. But why do these narrow bands of what is essentially rocky debris come in such a narrow band of colours? Or are we making an assumption here which just isn't true? N.B: Natural colour tones can be affected by many factors such as the brightness of the sun, the reflective surface of the sand etc. Worse than this, Internet images are notoriously easy to manipulate to enhance colours. To produce this article I have looked in detail at several photographs of each beach to try to ensure that colours are as authentic as possible. What is Sand, and Why is Sand a Shade of Yellow? Sand is best defined as granular rocky or mineral-based sediment, loose when dry, and consisting of particles 1⁄16 mm to 2 mm in diameter. Any finer grained sediment is termed silt. Any larger grained material is called gravel. How is sand formed? The one thing that almost all sand grains have in common is that they are produced by natural weathering and grinding actions - the effects of rain and river water, ocean currents, glaciers and wind, moving, tossing and scraping larger particles against each other, and also the freezing and thawing of ice within rock and the action of plant roots breaking up the rock, all working over decades, over centuries or even over millions of years, to gradually chip away and erode the material ultimately to produce smaller and smaller grains of sand. And where these grains of sand are deposited, typically at the mouths of rivers or where tides wash up on continental shores, the sand may gradually accumulate into beaches. The make up of a sandy beach may vary considerably, and will depend on many factors. Most are formed of material brought down to the sea from the surrounding landscape, and as the most common mineral in the Earth's continental crust is silicon dioxide SiO2 - quartz - then this is the mineral which is most prevalent in most sands - even more so because quartz is resistent and hard wearing, less easily degraded to dust or dissolved in water than some of the other constituents of rock. Quartz is naturally colourless or white, but impurities within the mineral can stain it appreciably. Notably traces of iron oxide Fe2O3 are a frequent impurity, and depending upon the concentration of this compound, the quartz grains may take on an off white or yellowish hue. The amount of impurity affects the tone. Not all quartz beaches are stained with iron oxide. And grains of other minerals may also be washed into the quartz mix, affecting the overall colour impression. And not all beach sands are even composed of quartz. Quartz is a particularly abundant mineral in rocks such as granite and sandstone, but if the predominant rock type in the neighbourhood is of a different composition such as shale, then the beach may consist entirely of this material. Volcanic regions produce their own highly distinctive rock types and the minerals to be found here are also very different. The weathering of such rocks and minerals over time can create equally distinctive beaches. Limestone is a common rock type composed not of quartz, but of the mineral calcium carbonate CaCO3, so in limestone environments a beach of calcium carbonate sand may exist. And calcium carbonate is not only a product of rock erosion; it is also the major constituent of the exoskeletons of myriads of tiny sea creatures including the seashells of molluscs and coral, and the accumulation of the remains of these can create the exotic sands of coral island beaches. 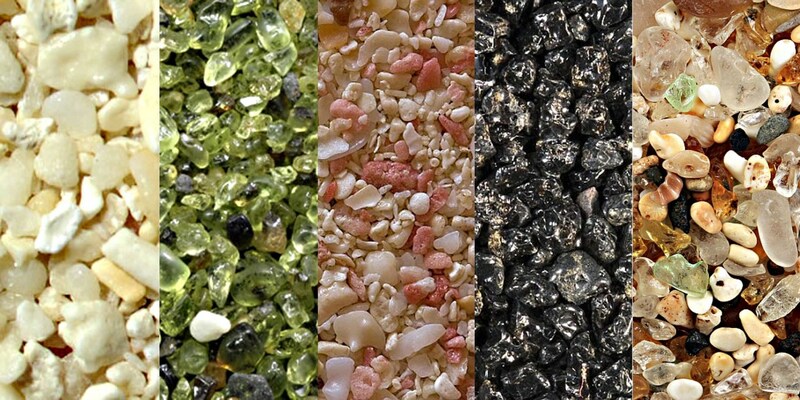 All of these different sources of material, as well as the method of transportation, the degree of sorting of the sand grains and even the age of the beach can all affect the size and shape of sand grains, and most of all, the colour - as we shall see in the following 10 examples. We will begin with a quartz beach. As we have already seen, most beaches are composed predominantly of quartz, but usually the quartz is either stained with iron impurities or intermingled with other grains which gives an overall yellowish colour to the beach. But what if the quartz is almost 100% pure? The best example of such a beach may be found in Australia. 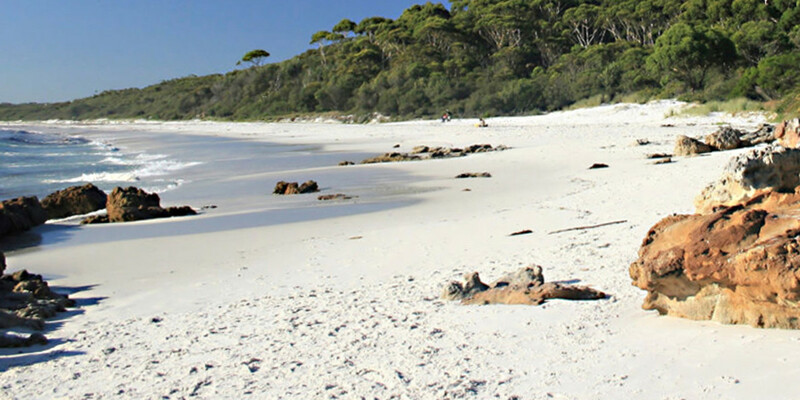 Hyams Beach on the coast of New South Wales is composed of extremely fine quartz grains. Quartz as we have said is colourless or white when pure, and Hyam's Beach is in the Guiness Biook of Records as supposedly the beach with the whitest sand in the world. There's actually three beaches in the area, and many who visit them wear sunglasses as sunlight reflected off the white surface of the sand is so strong. Such white sand is a tone we find particularly beautiful, and fortunately there are many examples of white beaches in the world. They are particularly associated with tropical coral islands and therein lies a clue to their formation. The majority of these in fact are not quartz based like Hyams, but are composed of coral, and the crushed shells of millions of tiny seashells. White sand can have still other origins; it may be indicative not of quartz, nor of shells and coral, but of quite a different mineral. White Sands National Monument in New Mexico is not a beach, but is worth mentioning as a famously expansive area of rolling dunes of pure white sand composed of the mineral gypsum CaSO4, looking for all the world like a snow field. 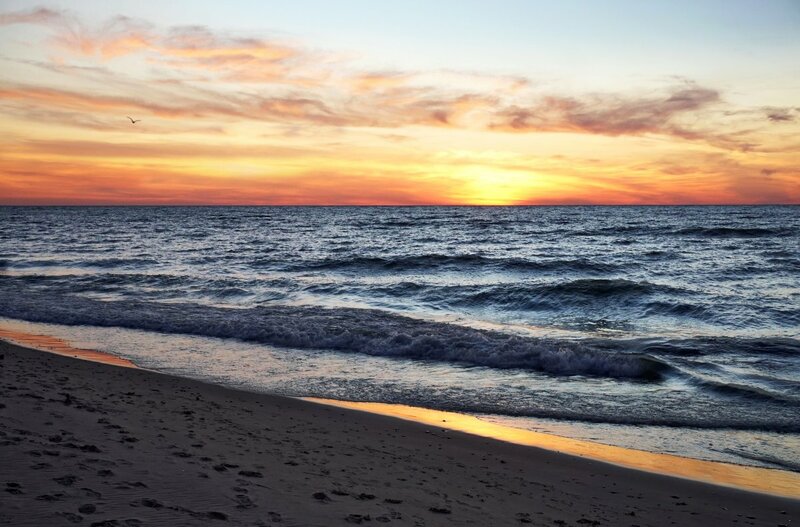 Impurities of iron may lead to yellowish sand, but more rarely other chemicals and minerals may be prevalent among the grains of a sandy beach. Shades of purple are not the first colour one associates with sand but in In Big Sur, California, there is a beach which has a distinct purplish tone to much of the surface. In truth even Pfeiffer Beach is not perfectly purple all across the shoreline, but there are patches of purple which are variable in extent, mainly at the northern end and most notably after heavy rainfall. The reason is that the normal quartz grains which make up the sand of the beach are supplemented by a purple manganese garnet sand deposit, washed down from the surrounding hills. Elsewhere in America, on Long Island, New York State, the sand can also sometimes exhibit purple patches as a result of the presence of the mineral piedmontite, similarly washed down from elsewhere - in this case, the mountains to the northwest. The beach at Big Sur, California is quite secluded and not as well known or as well signposted as the beaches of the nearby Pfeiffer Big Sur State Park, and for that reason many who visit the area will not be aware of the presence of one of the most unique beach environments in the world. But by all accounts, for anyone visiting the area, Pfeiffer Beach is a place well worth seeking out. The white and purple beaches above are quartz based, but as mentioned earlier, in areas of high vulcanicity a very different kind of beach can be produced by lava flows. Volcanic lava varies in constitution, but most common, particularly on island locations around the mid-ocean ridges, is basaltic lava. And basaltic lava cools to form a very dark rock indeed due to the presence within it of minerals such as pyroxene and magnetite. What happens when superhot basalt lavas hit the cool waters of the sea? They cool so rapidly they can even shatter into tiny sand-grain sized shards of volcanic glass, almost instantly creating a large expanse of black sand on the shoreline. Successive eruptions of volcanoes and the weathering of older onshore basalts will supplement the beach sand, though of course in the absence of further volcanic events, a black sand beach of this kind may eventually be depleted, or dilluted with other mineral types. In certain locations, most notably volcanic islands, black sand beaches are a common occurance. They are to be found for example on the shorelines of Hawaii (such as the famous Punalu’u Beach), and New Zealand (the 37 mile long Muriwai Black Sand Beach) and in the Caribbean. But some of the most impressive can be seen around the Spanish owned Canary Islands. 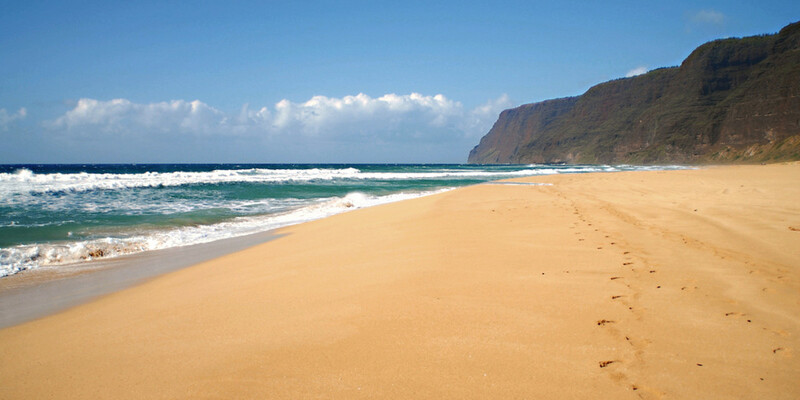 Pictured here is the beach at Puerto Naos, on La Palma. Note also the cliff face in the background - comprised of basaltic rock, the weathering of which will contribute to the beach material. As a popular tourist destination, the black sand beaches of the Canarys have a certain curiosity value, but there are two problems. 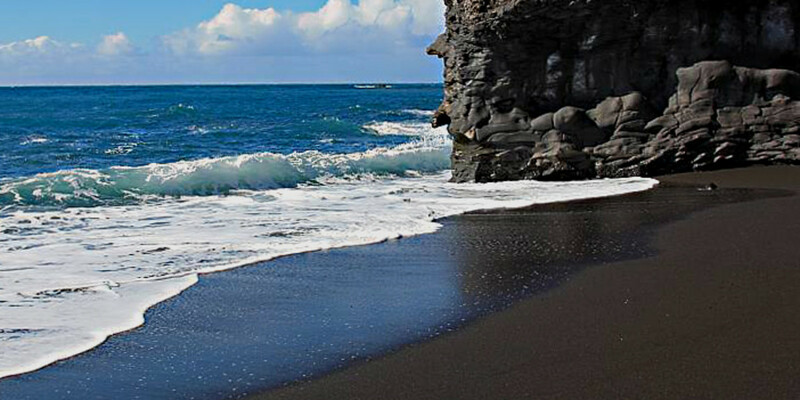 First, dark colours absorb rather than reflect heat, and so black sand beaches tend to be hotter to walk on. Sometimes too hot! And second, people unfortunately seem to have a deep subconscious belief that sand should be yellowish. There are natural yellow beaches in these islands, but in some of the most popular resorts, yellow sand has actually been shipped in from the Sahara Desert - because yellow sand just 'looks right'! So many volcanic beaches are black, but volcanic lava is often iron rich - both pyroxene and magnetite mentioned in the previous section contain large amounts of iron, but what happens when such iron-rich lava is ejected in an eruption and exposed to the oxygen in the air? 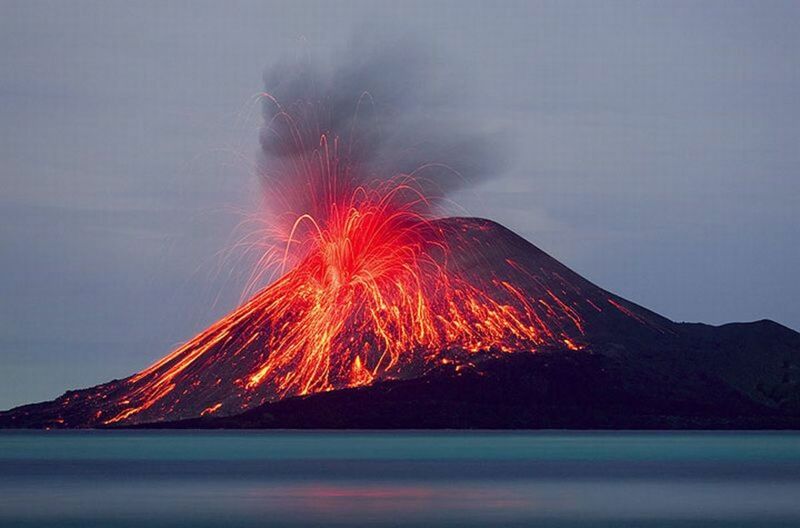 It eventually forms iron oxide. We have already indicated that iron oxide often has a major influence in discolouring quartz (and calcium carbonate) from white to a yellowish tint, but in basaltic lavas, the process can have an extreme effect. 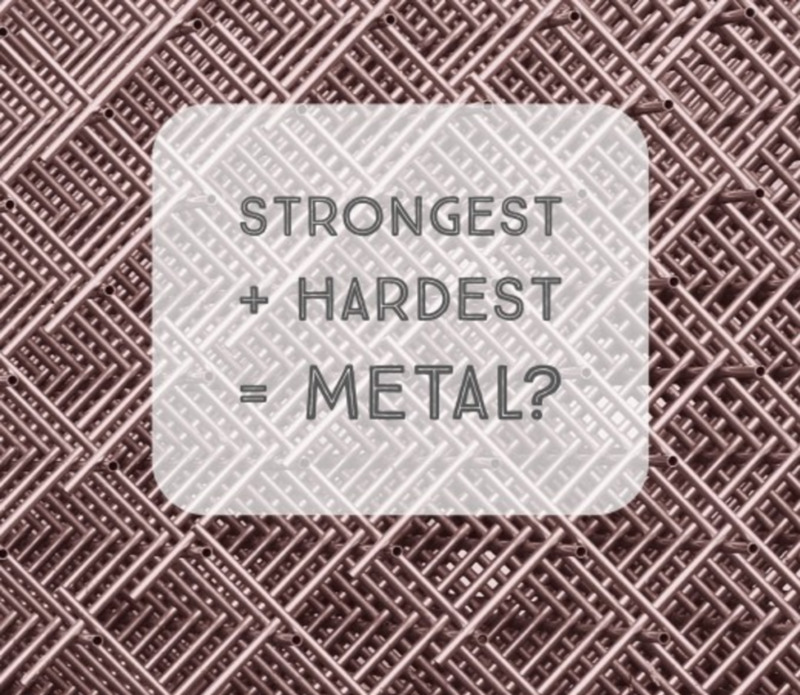 Pure iron oxide is actually a compound very familiar to all of us - it is rust. And iron oxide-rich basaltic sands are to be found on some volcanic islands turning the beaches - not black - but rust red. 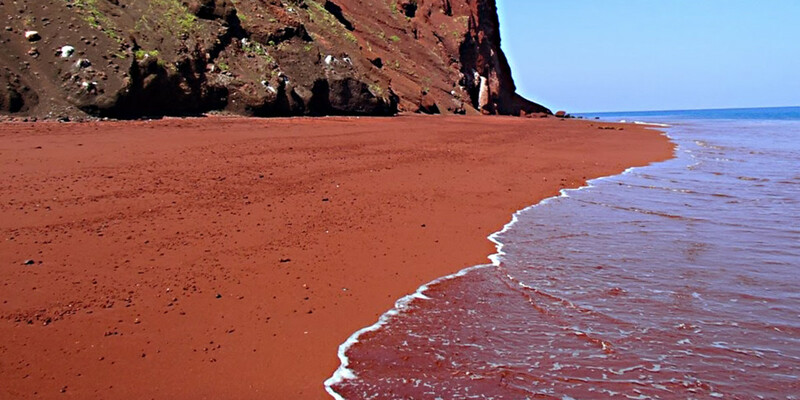 Hawaii, as well as its black sand beaches, also has a noted red sand beach at Kaihululu on Maui. But one of the most dramatic red beaches in the world is undoubtedly Kokkini Red Beach on the Greek island of Santorini - part of the Cyclades island group in the Mediterranean Sea. The dramatic appearance is self-evident in the photo below, and - as in the example of the black sand beach above - note the colour of the cliff face in the background. Just one of the minerals in basaltic lava, and also in metamorphic rocks (rocks altered by extreme temperature and pressure) is green olivine. And although olivine is not particularly common on the surface of the Earth, it does have two properties which can lead to accumulations of the mineral in great quantity. Firstly, the high melting point of olivine means that when magma cools, olivine is one of the first minerals to crystalise out and this may lead to its separation from other, still molten, minerals in the lava. Secondly, the crystals have a high density which makes them less likely to be washed away by rainwater and rivers and more likely to accumulate in a deposit (much in the way that the high density of gold makes it possible to 'pan' for that mineral by washing away lighter matter. The result can be the formation of a beach on which green olivine is the predominant mineral. However, the relative rarity of olivine in separation from other minerals means that very few such green sand beaches actually exist in the world. One such is Talofofo on the island of Guam, but arguably the very best of all is the remote Papakolea Beach in the Gulf of Mahana near the southernmost point on the Big Island of Hawaii, where the olivine consists of particularly fine crystals. Indeed, olivine is the mineral name of the gemstone peridote, and if one looks at the close-up photo of the microscopic sand grains from Papakolea at the very end of this article, they do have a clear gem-like quality. Imagine walking on a gemstone beach! But how long Papakolea Beach survives for is open to question. The volcano which generated the olivine sediment is now dormant, and a combination of weathering of the olivine, plus the strong Hawaiian surf leads some to believe that within 150 years the green beach of Papakolea will sadly be gone. As we have seen there are quite a few 'black' sand beaches around the world, but of course a truly black tone is very difficult to achieve in nature. More often we are talking about an extremely dark grey. But there are some beaches which are very clearly lighter in tone, and these are of two kinds. Some will appear paler grey merely because a myriad of dark coloured grains are mixed with a myriad of light coloured grains - perhaps basaltic lava sand and white quartz. The impression of greyness is almost an optical illusion, only apparent when viewed at a distance when the individual grains cannot be distinguished. But some other beaches are made up of genuinely grey material. 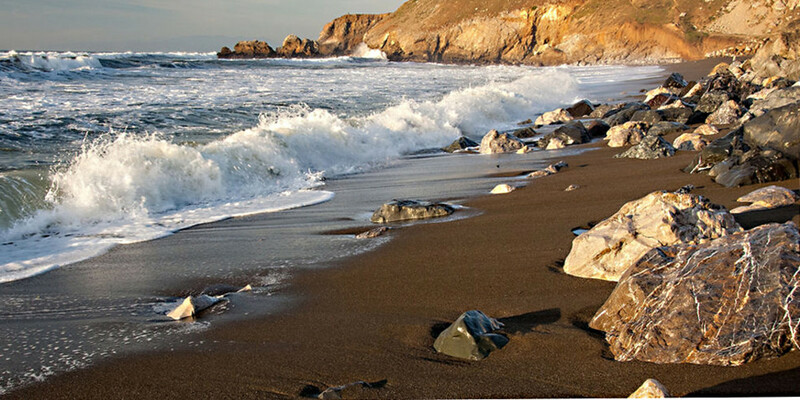 One such beach is in Humboldt County, California where a 3.5 mile beach goes under the charming name of Shelter Cove. It's a name which is quite evocative of a gentle and secluded setting, perhaps almost a romantic setting, but it has to be said that the colour of the sand here is anything but romantic! The reason for the mid-grey colour of this beach is that the predominant source of the sand is not quartz, or basalt; it's a combination of shale and greywacke (which comes from the German for 'grey earthy') sandstone, derived from the surrounding landscape. The last Californian beach we saw was grey. So perhaps we should now look at something more colourful? Sorry, I can only offer a brown beach from the same state. But Rockaway Beach, Pacifica near San Francisco is nonetheless another beach where the sand is of a most unusual colour, and some have described its mid brown hue as being the colour of chocolate, which may at least evoke a tasty thought or two! 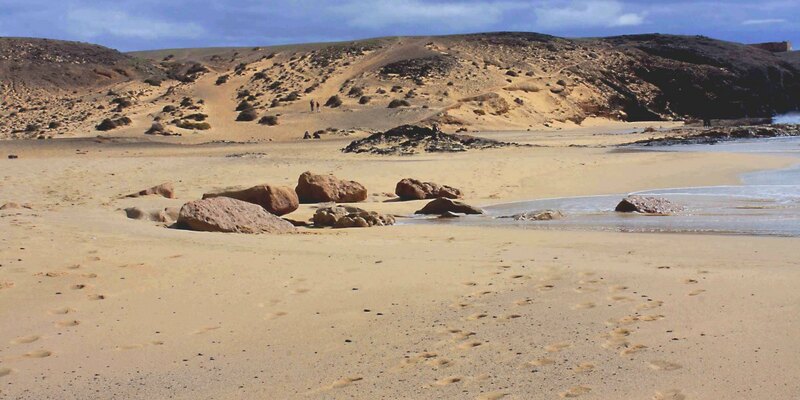 So far we've featured two predominantly quartz beaches, three beaches which are predominantly volcanic in origin, and one shale / sandstone beach. Rockaway, and the following two stretches of sand in this article are all largely composed of the other major beach building material - calcium carbonate. At Rockaway much of the surrounding geology is impure limestone of a blue-grey colour, but there are other rocks here too, and laying beneath the limestone is a metamorphosed volcanic greenstone - a basaltic rock which is usually dark greenish in colour. It is believed that the curious colour of the Rockaway sand is the result of the intermixing of limestone and greenstone debris. (It should be said that many quartz beaches can also take on a brown hue, but this is often due to a mixing of muddy silt or clay in the sand. The beach of Rockaway is a rarity - a genuine brown rock-sand beach). We know that pure quartz can create a pure white sand. So can pure calcium carbonate. And we have seen that increasing amounts of iron impurities and other minerals in quartz sand can create the overall impression of a beigy yellow or golden yellow beach. The same applies to calcium carbonate sands. And we know that the high levels of iron oxide in basalts can turn black sand, red. But there are also beaches of calcium carbonate where the level of mineral impurities in the predominant sand type is sufficiently accentuated to take on a deep orangy hue. Several of the best orange beaches are in the Mediterranean. One such is Porto Ferro in the north of the Italian island of Sardinia, where the colour is produced by limestone augmented with volcanic minerals. But the beach featured here is Ramla Bay on the island of Gozo, Malta, which boasts a far deeper coloured sand grain, than any of the other beaches on the island. The nature of the rock strata here is complex, but consists of at least five sediments of different limestones laid down over many millions of years, and mostly derived from the calcium carbonate remains of shallow water planktonic species. it appears that primary responsibility for the orangy colour here rests with the uppermost two layers. The top strata is called the Upper Coralline Limestone, a layer produced through the deposition of the predominantly red and white skeletal remains of algal, molluscan and coral species about 7 million years ago. The much narrower layer immediately below that is greensand, which should not be confused with 'greenstone', mentioned in the previous section about Rockaway. Greensand is a sedimentary limestone strata laid down about 10 million years ago, And greensand limestone attains an orangy brownish colour when exposed to oxidation. 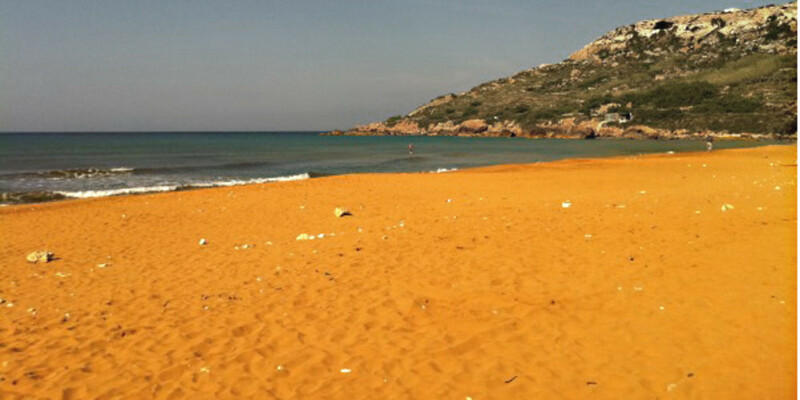 The combination of sediments containing crushed fragments of red and white coralline debris and oxidised greensand, appears to be responsible for the truly bright sands of Ramla Bay. 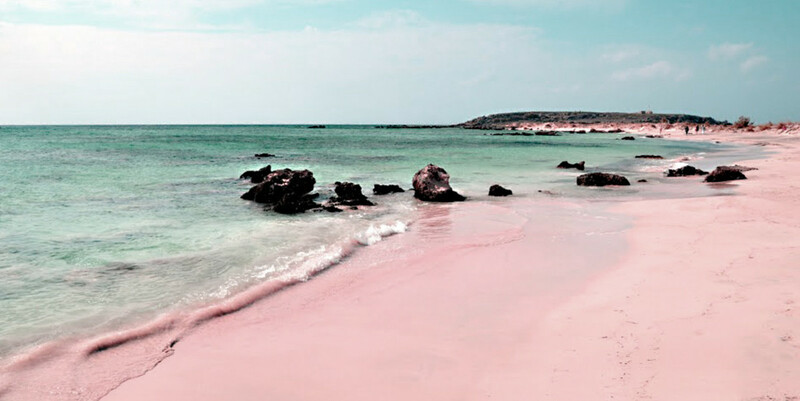 So there are exotically tropical white beaches, and strange and rare green and red beaches, and brilliantly coloured orange beaches, but surely if one wishes for the most romantic and picturesque of all, a pink beach has to be hard to beat! Surely the beach to propose on! And there are indeed several such stretches of sand in the world, created like Rockaway and Ramla Bay out of calcium carbonate sand. But unlike those beaches which feature the crushed and fossilised remains of seashells turned into limestone rock many millions of years ago, and subsequently broken down again by erosional forces, the beaches in this section are truly biogenic and comparatively recent in origin, created by coral and other skeletal fragments simply broken up by the abrasive action of the sea, and then gathered up in currents and washed up on to the shores usually of coral islands. Most commonly such coral beaches will be predominantly white in colour, but just occasionally an accumulation of the remains of one particular species of sea animal will generate a beach of a different colour. Some corals and shells have a distinctly pinkish or reddish colouration and these can create a beach sand with a pinkish hue. There are fine examples of these on the island of Bermuda, but the example which is shown here is Harbour Island, one of several pink beaches on the eastern seaboard of the suitably exotic Bahamas. Harbour Island is considered to be perhaps the best of all. The sand here is a combination of the red calcium carbonate shells of tiny single celled animals called foraminifera, combined with white quartz sand. 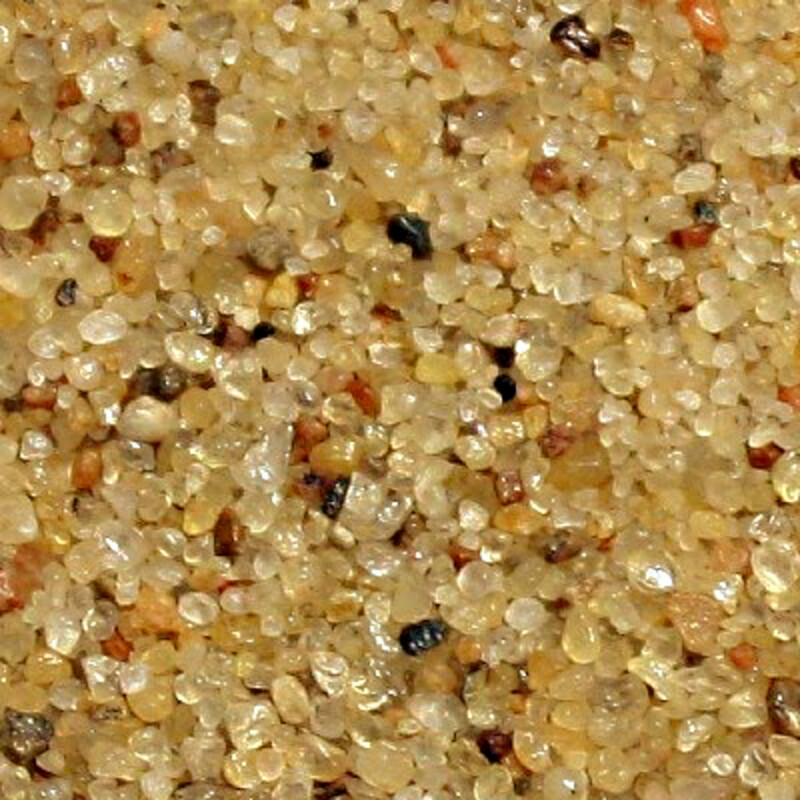 (Similar sand from a Bermudan beach can be seen in the composite photo at the end of this article). 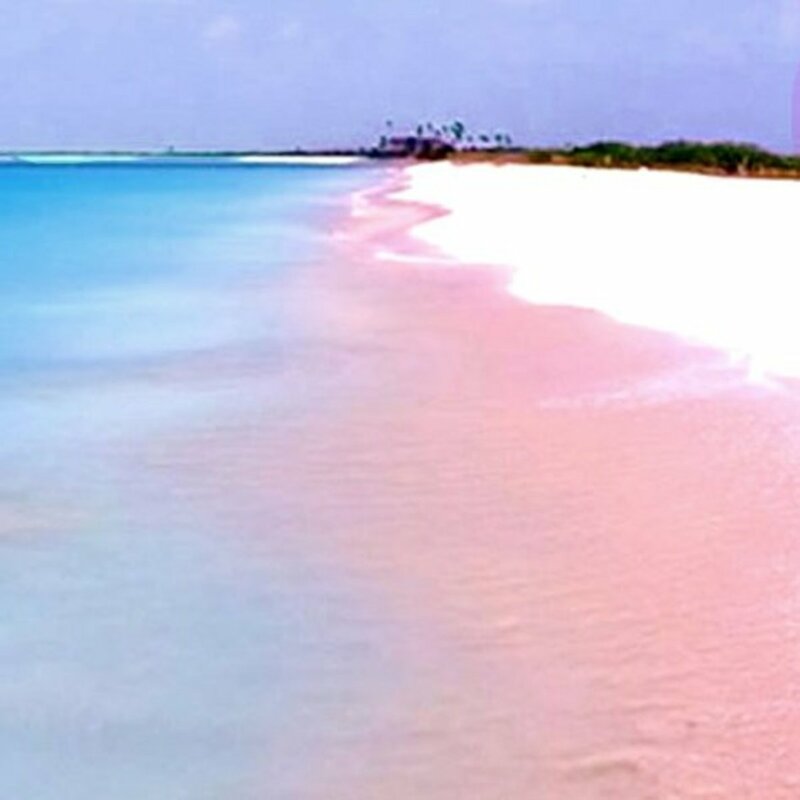 The three mile stretch of pink sand at Harbour Island is by all accounts exquisite to behold. I shall have to see it one day! If any place on Earth takes the prize for the greatest range of beach sand colours, then it has to be Hawaii. The Hawaiian Islands have already been mentioned several times in this article, but let's finish with just one more example. This one however, could be thought of a bit of a cheat because the materials which make up the grains on this next beach are not at all natural. They come in fact from human garbage! But it's not too much of a cheat, because although the material is not natural, the processes which have turned it into a sandy beach most certainly are just the same and just as natural as any other on this page. This is Glass Beach and it is on Kauai in the Hawaiian Islands, and the clue to its formation is in the name. Glass Beach is the result of a nearby shoreline garbage dump, and it has been developed over a period of decades from the thousands of broken bottles, including red, brown, green and blue glass, and lots of other coloured glass waste deposited in the dump in the days before proper waste disposal came into being. Subsequently the glass has been smashed together, broken, tumbled and abraded into tiny fragments by the strong currents here, and then washed up to overlie what was originally a basalt beach (see the rounded glass fragments in the photo at the bottom of this article). 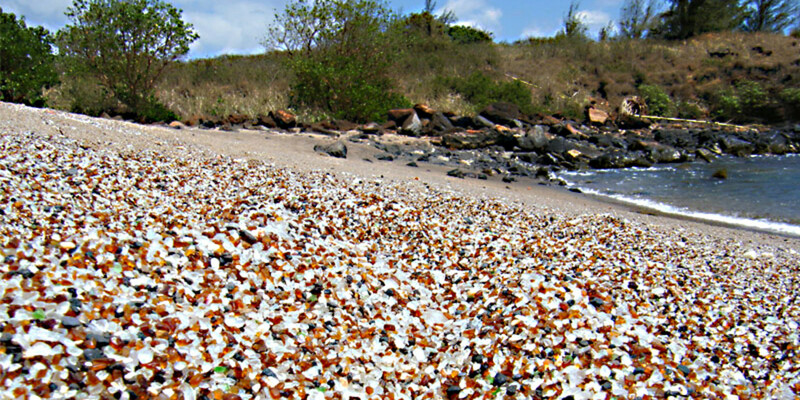 Located on the southern shore of Kauai, Glass Beach is of course a very recent creation, which may not survive long into the future. 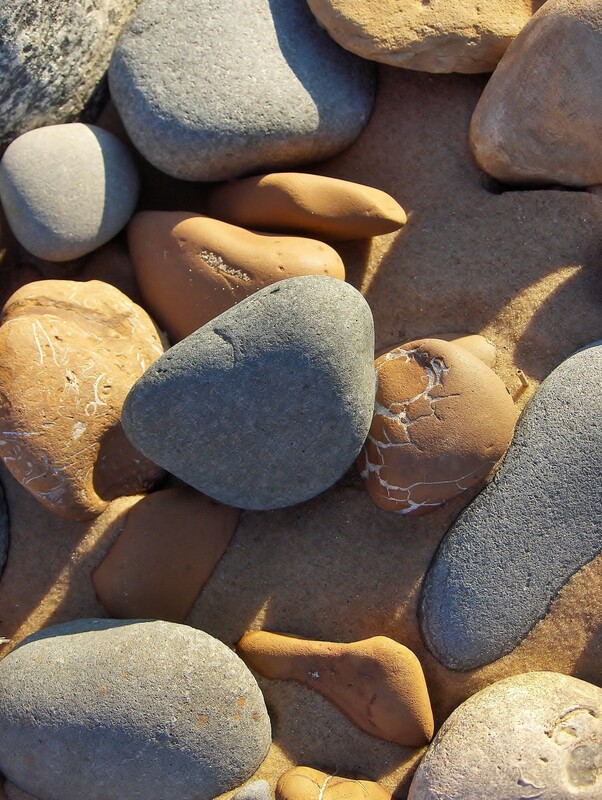 But whatever one thinks of it, it is a perfect illustration of how the forces of nature can take any hard wearing, resistant material - rock, shell or manmade - and grind it, if not into dust, then certainly into grains of sand. I hope you have enjoyed this look at the most unusually coloured beaches in the world, fashioned from quartz, from quartz impurities, from local limestones and shales or from volcanic rocks and minerals, and even from manmade materials such as glass. The only thing they all have in common is the causative agent - the relentless erosional grinding of nature's forces as they toss and churn and gradually break down matter into the tiny rounded particles we call 'sand', before depositing it on to the coastline in the landform we call a 'beach'. Actually, perhaps they all have one other thing in common; all of them are fascinatingly different from the normal 'sandy-coloured' beaches and all of them have an appeal and a beauty of their own. Which makes all of them, well worth seeing. Information for this article has been gleaned from Internet sources, where possible from known reputable sites. However, it is not always easy to verify the accuracy of these sources. If any reader is aware of any errors, then please let me know - I wish for accuracy in all my articles. Jean Bakula; Thanks Jean. I'd like to make it a goal to visit all of these! Appreciate your comment. aviannovice; Thank you Deb, and apologies for not responding sooner. Most black sand beaches result from the weathering of volcanic rock, but I would not have thought that was the case on Campobello Island on the east coast of Canada, unless it's the result of very ancient volcanism. I wonder what the origins of that beach are? Incredibly beautiful pictures! I want to pack a suitcase and grab a plane right now. You really did a fabulous job, thank you for sharing your knowledge of these lovely sites. I was not aware of all these different colored sand beaches. One that you may not know about is the black sands of Campobello Island, a famous Roosevelt retreat. MsDora; Thanks Dora. I agree with you - as natural wonders they are remarkable. I myself have only seen black sand beaches in the Canary Islands and some which could be described as white, but which are not as pure or vivid as the example shown here. I did as a child see the White Sands National Monument in New Mexico - not a beach, but a large area of astonishingly white inland sand dunes! Incredible contrasting beach scenes and your explanation of their differences, as well. I had no idea there were so many colors of sand. Loved the photos. This is a very informative and educational article, Alun! It's also a very interesting article, which I'll share. Thanks for all the research that you did to create this hub. What an actual eye opener! These beaches should be listed among the wonders of the world. I'd like to spend hours on the pink and purple beaches. Thanks for the explanations on sand grains. Amazing! It's like Northern Lights in the ocean. I wonder if they have it in PURPLE - like black lights! Wow! I've seen bioluminescence only once, and it was red. Maybe bioluminescence comes in many colors??? Say Yes To Life; Thanks Yoleen. I think I really envy you, living in Hawaii, and not, of course, just for the colourful beaches! 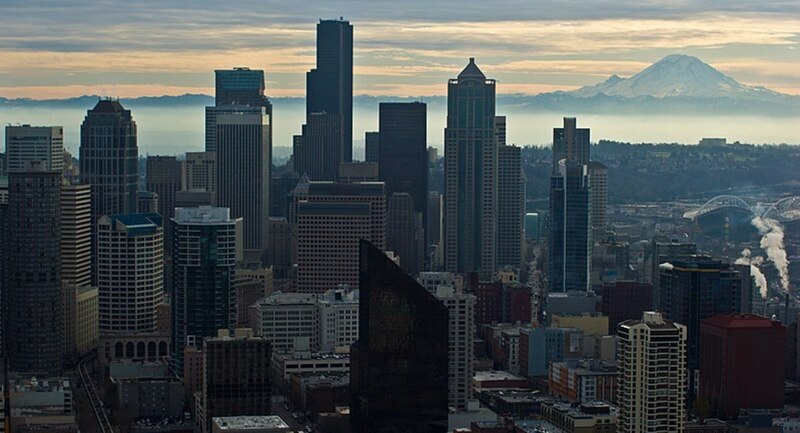 Great part of the world. This is fascinating. Since I live on the Big Island of Hawaii, I have visited the Green Sand Beach many times. I even sand boarded there once, and wrote a hub about it. 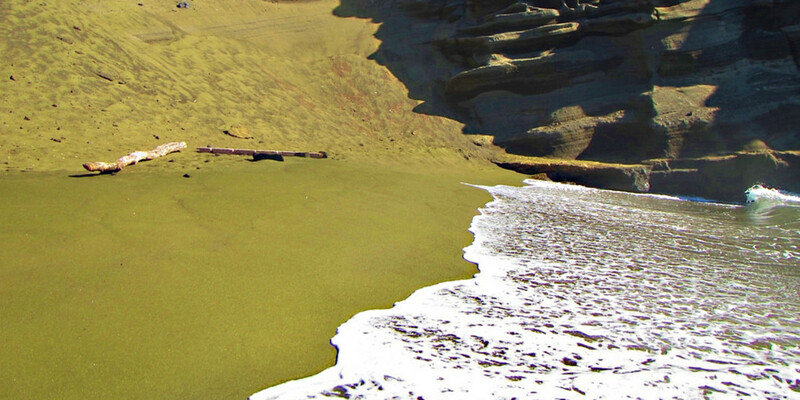 There are only 2 green sand beaches in the world; the other is in Guam. When I lived in Silicon Valley, I used to visit Pfeiffer Beach with its purple sand. 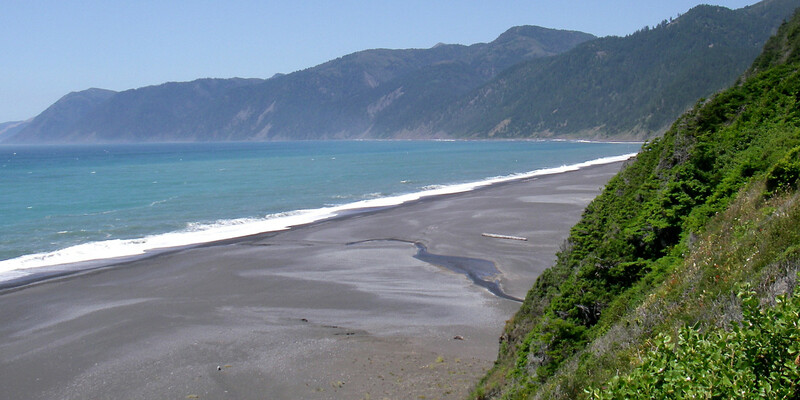 I also went to the Lost Coast, with its grey sand beaches. If we can find a blue sand beach, we could produce a rainbow! 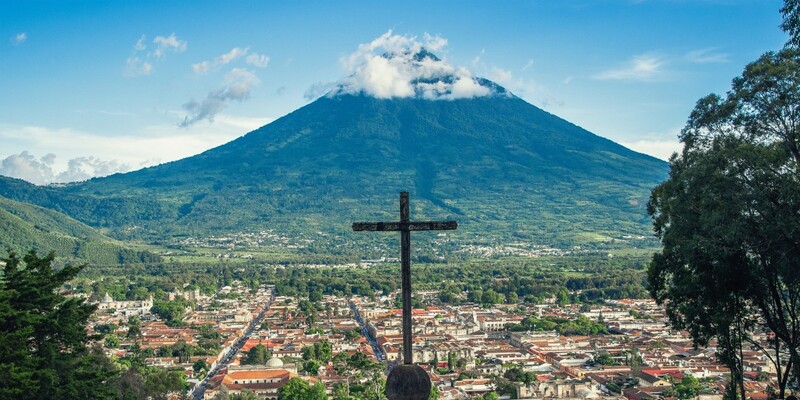 Beautiful article! Never knew there were so many colored beaches.